If you’re like many people, you may have a jar of coins sitting on your counter that you’ve been collecting over the years. Unfortunately, as they’ve occupied the jar over the years, they’ve accumulated germs, dirt, and other gunk that has removed the natural luster of the coins, making them visually unappealing. If you want to restore your coins to their natural brilliance, learn how to clean coins properly with these tips. 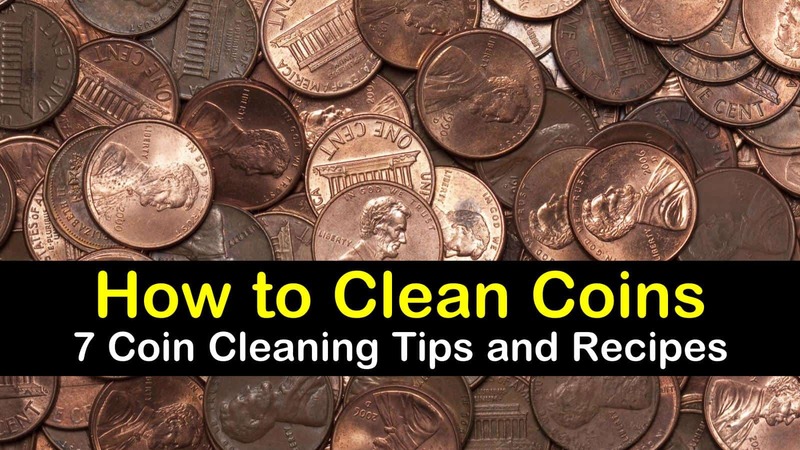 While you may want to get your spare change looking shiny and new, if you own collectible, high-grade, proof, or uncirculated coins, you’ll want to take these to a professional to have them cleaned, because they know how to clean old coins without damaging them. Cleaning your valuable and collectible coins at home will reduce their value and could harm them so severely that they’ll only be worth as much as the material they are made from. Whether you have everyday coins or collectible items, your coins are probably pretty dirty, resulting in them becoming easily corroded. If you want to have clean coins, here are some of the best ways for how to clean change with items that you use every day. Below are the different cleaning solutions you can use and the homemade methods that work. Cleaning old coins can be easy but needs to be done with caution. You want to be sure to preserve the coins’ patina because it is an essential component when determining the value of the coin. When cleaning old coins, you want to first consult with a coin dealer so they can learn the value of the currency and provide you with a recommendation for cleaning the coin. If you already know the value of your coin you can clean them using the following DIY coin cleaner. Fill one of the plastic containers with two cups of the distilled water. Stir in the mild hand soap and stir to create a soapy water mixture. Put the coins you want to clean in the container and allow them to soak for 10 to 15 minutes. Take the coins out and place them on the clean, soft cloth. Using the old, soft toothbrush scrub the face of the coin softly. Place the coin in the second container filled with the remaining distilled water. Allow sitting for five to ten minutes. Remove from the bin, place on the soft cloth and allow to dry naturally. This method for how to clean coins that you use every day is a little bit more abrasive than the technique above. You should only use this technique for those coins that have no value. You should not use this technique on coins that have a valuable patina because it can damage the coin, rendering it worthless. Start by preparing a solution of warm, soapy water. Pour the cleaning solution into a watertight jar and add a small amount of sand. Place the coins in the jar, seal the lid, and shake it around. Remove the coins from the container and rinse them under warm water. Use a clean, soft cloth to dry the coins, but do not rub the coins, because it can damage the surface of the material. You can clean your coins without damaging them by soaking them in a bath of isopropyl alcohol and salt. When combined, these ingredients are both abrasive and acidic and will clean any built-up dirt off your coins. To clean delicate silver coins check out our silver cleaner recipe showing you to make your own homemade cleaning solution. To make the coin bath, you will want to combine one cup of isopropyl alcohol with two tablespoons of salt in a medium-sized bowl. Mix the solution and add your coins to the dish. Let them soak for at least two hours. If they are filthy, you may have to allow them to soak for up to a week. Rinse the coins, using distilled water. Avoid using tap water because it contains chemicals that will, over time, erode the coins. The purified water will rinse off any leftover chemicals from the coins. Place the coins on a clean, soft cloth and gently dab them, turning over once to ensure both sides are dry. Then allow to air dry the rest of the way. Using olive oil to clean your coins is a simple and inexpensive technique. The olive oil can penetrate the dirt on the surface, loosening it from the currency. To use this technique, you’ll need a plastic container and some olive oil. First, place the coin in the bowl, and cover completely with olive oil. Allow the coin to sit in the tub for at least a month, and up to six months. During this time, if the olive oil becomes discolored, change it. After the coin has sat in the olive oil, remove it from the bowl and clean the coin with soap and distilled water, gently scouring the currency with an old toothbrush. Cleaning pennies can be a bit of a challenge because there are different methods to use depending on the creation date of the coin. Pennies that were made before 1982 are made with more copper, leading to a more intense chemical reaction. Make sure any brass polish or coin cleaner you are using does not damage your coins. If you have any pennies that were created before 1982, it’s best to check with a coin dealer to determine if it is valuable. If you want to create a bright orange-coppery color, here’s how to clean a penny using vinegar and salt. You can also use lemon juice as a substitute for the vinegar if you don’t have any white vinegar in your pantry. The low levels of acid in the lemon juice or vinegar are used to remove the patina that tends to form on older and dirty pennies. Add the vinegar or lemon juice to the plastic container. Stir in the salt. Continue to stir until the salt dissolves. Place the pennies in the bowl, making sure you don’t stack them on top of each other. Allow them to sit for five minutes. If they aren’t as bright as you want them, allow them to soak for another five minutes. Remove the pennies from the cleaning solution and rinse under distilled water. Use the soft cloth to dry the pennies gently. Baking soda is often used as DIY jewelry cleaner and in homemade metal polishing solutions. Place two tablespoons of baking soda in the bottom of a small bowl. Begin to add water until you have a thick paste. Using your thumb and forefinger, grab some of the paste and apply it to the penny. Gently rub the mixture onto the front and back of the penny, using small circular motions. Rinse the penny with distilled water and dry with a clean, soft cloth. While it may sound a bit weird, you can clean your copper coins with ketchup. The acid found in tomato ketchup will help to remove any oxidation that has formed on the currency. To start, place about ¼ cup of ketchup in a small container. Next, dip an old toothbrush in the ketchup and, holding the penny on a flat surface, begin to scrub the ketchup into the surface, using small circular motions. Continue to do this for one minute. Rinse the remaining ketchup from the surface of the coin by running it under warm water. Finally, dry the penny with a clean, soft cloth. Cleaning your coins can be a fun and enjoyable experience when you know what you are doing. It is essential that if you think that you may be in possession of a valuable coin that you don’t try any of the methods listed above until after you’ve talked to a coin specialist because cleaning valuable or ancient coins could result in damaging them and lowering their value. 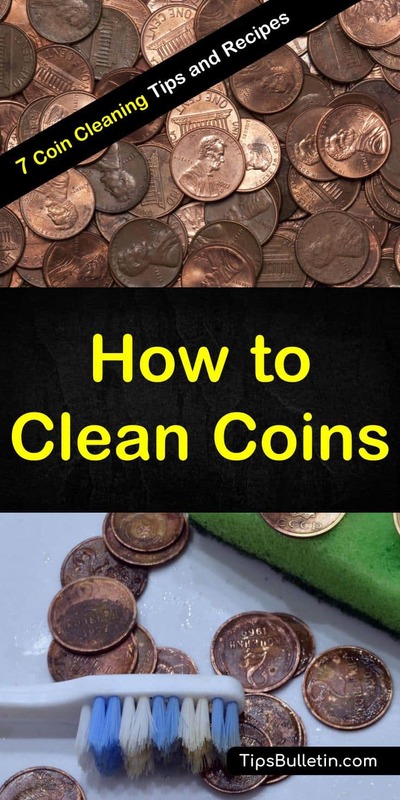 We hope you enjoyed learning about how to clean coins with everyday ingredients. If you found the information in this article useful, please don’t hesitate to share it with your friends and family.